An important exampleof the gravitational lens effect is the quadruple image shown below. It is called the Einstein Cross. 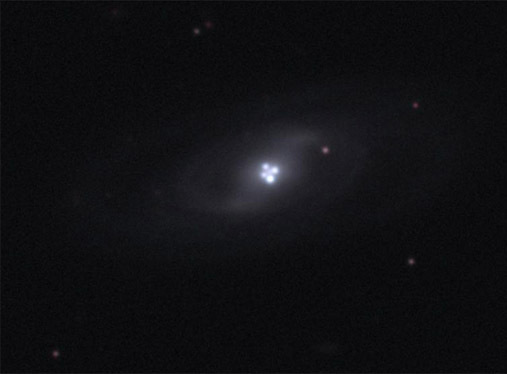 This system is called the Einstein Cross, because it is such an excellent example of the phenomenon of gravitational lensing.This phenomenon was postulated by Einstein as soon as he realised that gravity would be able to bend light and thus could have lens-like effects. This system is also known as Huchra's Lens, after its founder. The four separate images have the same redshift of Z= 1.695 . This suggests that they are quasar images, and in fact multiple images of the same quasar. The image is interpreted as gravitational lensing by an almost perfectly aligned galaxy for which the red shift was measured to be Z= 0.0394 . Using a Hubble constant of 71 km/s /Megaparsec as indicated by the WMAP project, the Z measurements imply a distance of 500 million light years for the lensing galaxy and 10.4 billion ly for the quasar. The quasar is over 20 times further away than the galaxy that lenses it to give the four images. Modeling suggests that the alignment of the lensing galaxy and the quasar is within 0.05 arcseconds. Credit: J.Rhoads, S.Malhotra, I.Dell'Antonio (NOAO)/WIYN/NOAO/NSF. The gravitationally lensed quasar is designated Q2237+0305 and the image was taken by the 3.5-meter WIYN telescope, on the night of October 4, 1999. These high resolution examinations of the Einstein Cross were taken at times three years apart and show variations in the image. The variations are attributed to effects of individual stars in the foreground galaxy upon the gravitational lensing. Credit: G. Lewis (IOA) and M. Irwin (RGO), William Hershel Telescope.